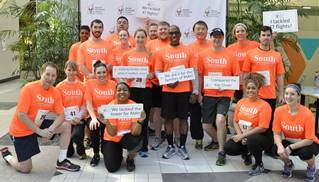 A team of 24 South University, Cleveland students, faculty, staff and alumni recently climbed 37 flights of stairs to raise money for charity. The 15th annual “Tackle the Tower Stair Climb” benefitted the Ronald McDonald House of Cleveland. The South University team raised $700 for the charity and placed 4th in the coed competition.